Get tips and instructions for how to incorporate audio content into your classroom. We welcome your input. Please contact us with any feedback. 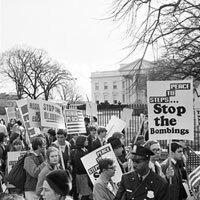 The Vietnam War took the lives of more than 58,000 Americans and more than one million Vietnamese. Four American presidents tried to end the conflict. The lessons they learned echo today as the United States debates what to do in Iraq. Sneak up to the front lines with a Willmar soldier's audio diary and slip into the Oval Office to hear U.S. presidents tackle the issues in one-on-one conversations.